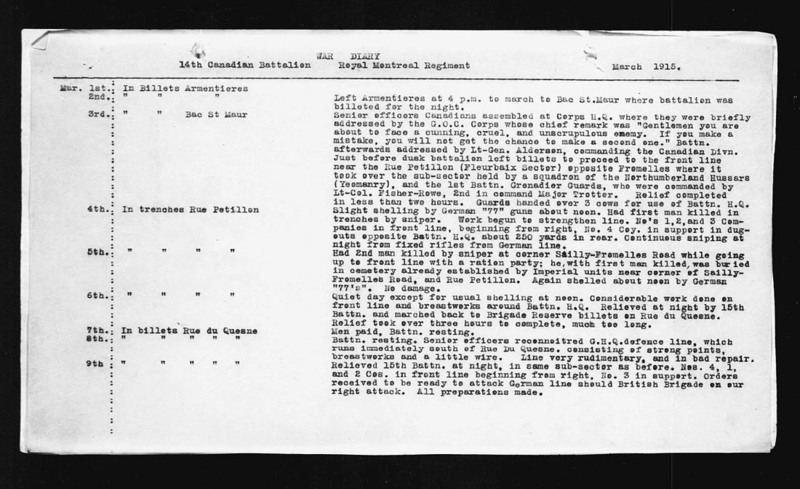 The Battalion history erroneously names the first man killed in action as “Pte. J.P. Rattigan.”  In fact Rattigan’s death occurred two weeks later, on March 18th. 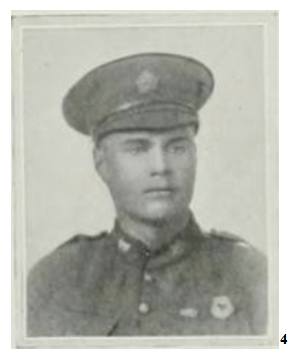 The man killed in action on March 4th was Pte. Edmund E. Hopey, a 21 year old American from, Dorchester, Massachusetts. Edmund Eugene Hopey was born June 25th, 1893, the only child of George Allen Hopey and his wife Ida Tedella (nee Corey) of 13 Granite Avenue, Dorchester, Mass., U.S.A. He was educated there and was a carpenter by trade. He joined the 8th Massachusetts Militia at Cambridge, Mass. on May 6th, 1914, but after the outbreak of war he went to St. John, N.B. and offered his services and was accepted for service with the 14th Battalion, Canadian Expeditionary Force on Aug 17th, 1914. He is said to have met his death while “covering a parapet.” He is buried at Le Trou Aid Post Cemetery, Fleurbaix, France. R.C. Featherstonhaugh, The Royal Montreal Regiment 14th Battalion C.E.F. 1914-1925, Montreal, The Gazette, Printing Co., Ltd., 1927, pg. 30.